Conference North club Worcester City could fold this summer, as season ticket sales are falling well short of the board’s target. With a figure of fifteen hundred targeted, so far only around 360 have been bought for the 2013-14 season. This will be even harder for the club to take, as the tickets were available for just £100. City will, of course, be playing their home games at Kidderminster’s Aggborough stadium, eleven miles away, after their historic St. George’s Lane ground was sold for housing. 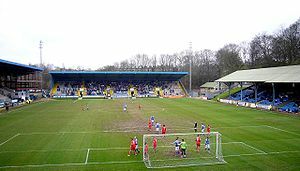 The team normally have more than seven hundred supporters on a regular basis at home games, and with a population of more than a hundred thousand, the season ticket target seemed achievable, especially as there were more than four thousand at St. George’s Lane for the final game at the ground against champions Chester FC. The problems stem from the reduced income from the sale of St. George’s Lane. Originally, the figures being quoted for the sale were in the region of £8million, but when the sale was finalised, it transpired that the final price had been more in the ballpark of £3million. This has led to a huge shortfall, and their plans to build a new ground at Nunnery Way, on the outskirts of the city, are now under threat. They are also facing a £400,000 tax bill. The low uptake on season ticket sales, coupled with the extra costs of playing at Aggborough next season, has led to a drastically reduced playing budget for next season. Manager Carl Heeley has been unable to offer terms to any of last season’s playing staff, and reports suggest that the budget may have been cut by as much as forty percent. While I was sad for the fans to see the club play it’s final game at it’s famous old ground, I have to agree with Mr Layland. Us fans are always quick to lay blame at the door of directors for not putting every penny they own into our club, but if we don’t put our own hands in pockets to support them, then the writing is on the wall. Granted, it will not be easy for lots of fans to get to Kidderminster for “home” games, but the fact that they got more than four thousand through the gates on the final day of the season suggests that there is a decent fan base in the area. Let’s just hope that more of them dig deep and hopefully save the club. Telford United’s stay in the Blue Square Bet Premier came to an end on Easter Saturday as a 3-0 defeat at the hands of fellow midlands side Nuneaton saw them slip back in the Blue Square North. The season has been poor one for the Bucks from start to finish really, and not just on the pitch, but in the Dugouts too. In February they parted company with boss Andy Stinton who had taken the Bucks into the promised land of the Blue Square Bet Premier and delivered them a mid-table finish in their debut season. But then following a winless run which stretched back to October when their last win was a 4-1 victory over Dartford which saw them go 8th they have slipped down and down before parting with the boss. In fact, Telford made Conference history by losing the most games on a consecutive run with 26 games without a win; the previous total was AP lemmington in the 81-82 season going from August to February without registering a win. Respected manager Mark Cooper, who has Darlington and Kettering on his CV in Non-league football, was then handed the hot-seat at the New Bucks Head. However, just weeks later, he departed to become assistant boss of Swindon Town FC. No one can deny him the chance to work in the football league but it left Telford looking for their third boss of the season- Graham Hyde was put in caretaker role but he also lasted weeks before leaving the Shropshire club after a 2-0 loss to Macclesfield. The final (for now) manager of the season to take over is John Parash who is supported by goalkeeper Ryan Young (who has played over 300 games for Telford) and Phil Trainer (who scored the goal to promote Telford into the Blue Square Premier). John did his best but sadly the end came when they lost to Nuneaton on the 31st March. But what now for the Bucks? Well they will be looking to end the season on a high with a couple of wins. On Easter Monday they drew 0-0 with promotion chasing Forest Green Rovers, which is an okay start with the pressure now off the Bucks. The next step is to appoint a successor to take over the hot seat. I am sure John Parash will be considered but other names in contention include former England Midfielder Steve Hodge, former Hyde boss Gary Lowe and former Hinckley manager Dean Thomas. Also the man whose team sent Telford down is in contention being Kevin Wilkins, boss at Nuneaton. Then after that it will be a case of attempting to regain their status in the Blue Square Premier by going up in the Blue SQ North. It will be tough. Although Chester have run away with the league this season, and are all set to win the division, teams like Halifax, Brackley, Boston and Guiseley FC are still in there, and it will be tough for the Bucks, but if they can keep hold of the likes of Ryan Young and Phil Trainer then they might have a chance of making a fast return to the Blue Square Premier. The first round is now done and dusted, and we know the teams that will be in the hat for the second round draw, barring those ties that went to replays. So how did the non-league representatives do? The lowest ranked team left in the competition, Redbridge FC, did themselves proud as they held Oxford City to a goalless draw at Oakside. City, who are top of the Southern Premier Division, were favourites to win, but will have to do it in a replay now. Bath City, bottom of the Conference Premier, have got themselves a home replay after their 1-1 draw at League Two side Dagenham & Redbridge. The Romans took the lead on eleven minutes through midfielder Marc Canham. Daggers equaliser came four minutes before the break, striker Brian Goodall getting his first of the campaign to take the game to a replay. Bath City will certainly fancy their chances of a causing an upset in that one. In the other games involving League v Non-League, two teams got wins, and two more will take their ties to replays. The winners were Luton Town and Fleetwood Town. The Hatters saw off League Two outfit Northampton Town, the only goal coming ten minutes from time courtesy of young midfielder Adam Watkins. As for Fleetwood Town, they went one better by downing League One side Wycombe Wanderers 2-0. The goals in this one came from strikers Andy Mangan and Jamie Vardy. The Cod Army even had to play the second half with ten men, as Richard Brodie was sent off on the stroke of halftime. These two results are probably not too surprising, in terms of the clubs’ positions in their respective leagues; Both Wycombe and Northampton are fighting relegation, while Luton and Fleetwood have ambitions of becoming Football League clubs for next season. The two non-league teams facing replays against their league opponents are Grimsby Town and Stourbridge. The Mariners got a good 0-0 draw with League Two playoff chasers Port Vale, and will fancy their chances back at Blundell Park in the replay. Stourbridge, meanwhile, came within two minutes of eliminating League Two’s bottom club Plymouth Argyle at the first attempt. The Glassboys were 3-2 up until Onismor Bhasera levelled for The Pilgrims, who had two men sent off in those hectic final ten minutes. Plymouth will not enjoy their trip to the Midlands for the replay, and I can see Stourbridge progressing. There were also eight all non-league ties in the first round, with three of them needing replays. Draws between Hinckley United and Tamworth, Maidenhead United and Aldershot, and Cambridge United and Wrexham will all be sorted out with replays. The biggest result of the day, though, came at The Testwood Stadium, where AFC Totton thumped Bradford Park Avenue 8-1. Four goals in each half for The Stags saw them progress to the second round draw for the first time in their history. Bradofrd PA did have two players sent off, the first after just eleven minutes. Technically, Sutton United caused an upset by beating Conference Premier side Kettering Town, although United are second in Conference South, while their opponents are battling relegation. Craig Watkins got the only goal of the game after 64 minutes. Not a bad way to celebrate his 100th appearance for the club. Another Conference South side, Chelmsford City, hammered Premier side AFC Telford 4-0 with goals from Aiden Palmer, Craig Parker and a brace from skipper David Rainford. There were no such shocks at Croft Park, where visiting side Gateshead of the Conference Premier beat North outfit Blyth Spartans 2-0. Jon Shaw and Micky Cummins got the goals to settle this local derby. Finally, Salisbury City avoided a shock by seeing off Southern Premier side Arlesey Town 3-1. Will The Shay witness a massive shock? There is one huge game today, of course, as Conference North side FC Halifax Town host League One’s runaway leaders Charlton Athetic at The Shay. 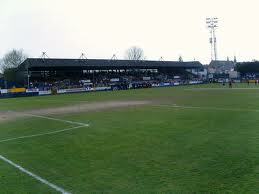 It is undoubtedly the biggest game in the new Shaymen’s life. 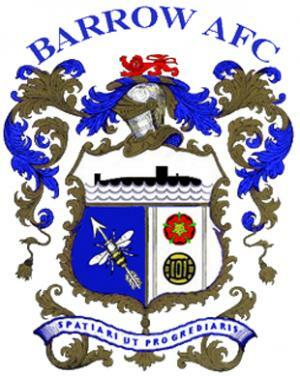 The club were formed in 2008 after the liquidation of the original Halifax Town AFC due to heavy debts. There hasn’t been a monumental shock yet in the first round, maybe this could be it? There are nine matches in Conference North tomorrow, with the top four all in action. Leaders Hyde travel to Boston United, who currently lie in tenth place. Hyde have won their last three league games without conceding a goal after a run of four without a win. Boston, meanwhile, have a decent home record, with three wins and three draws from their eight matches at York Street. Hyde should pick up all three points, although they won’t have things all their own way. Second placed Stalybridge Celtic are the only top four club to be playing in front of their own fans this weekend, as they entertain Histon United. Celtic have only lost once this season, a 0-2 reverse at Colwyn Bay in October, but have won two and drawn one since that defeat, and scored ten goals in the process. They boast the second and third top scorers in the division, Connor Jennings and Phil Marsh, who have 27 league goals between them. Histon lost 4-0 at Hyde last time out, and so a trip to the second placed team is probably not high on the wishlist for them! They did win the two previous games, but lost three of the five before that. It’s hard to imagine anything other than a comfortable home win. Third and fourth placed Gainsborough Trinity and Guisely are both on their travels, with Trinity going to North Wales to take on mid-table Colwyn Bay and Guisely making the trip to second bottom Eastwood Town. My money is on a Guisely victory, but Colwyn Bay will take something from their match with Gainsborough. There are six matches in the South, with fourth placed Dartford the highest placed team playing. They host mid-table Weston-Super-Mare knowing they will go second with a win. Over the last few games, Dartford have been alternating wins and defeats, and going by that run a defeat is next in the sequence. That doesn’t seem very likely though, and I would expect to see the points stay with the home side. Game of the day though could be at Meadow Park, where eighth placed Boreham Wood host Dover, lying in fifth. A win for the home side would see them within a point of their opponents, while a defeat for Dover would see them slip down to sixth on goal difference, even though sixth or seventh aren’t playing! Bottom club Thurrock are not in action which means they could find themselves cut adrift if the two clubs above them can win. That will be no mean feat for either Hampton & Richmond Borough or Staines Town however, as they both travel to teams just outside the top ten. Borough go to Dorchester, while Staines are at Tonbridge. It is hard to see anything other than home wins, although one of them might just scrape a draw.